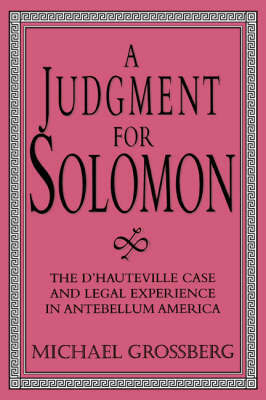 A Judgment for Solomon tells the story of the d'Hauteville case, a controversial child custody battle fought in 1840. It uses the story of one couple's bitter fight over their son to explore some timebound and timeless features of American legal culture. In a narrative analysis, it recounts how marital woes led Ellen and Gonzalve d'Hauteville into what Alexis de Tocqueville called the 'shadow of the law'. Their multiple legal experiences culminated in an eagerly followed Philadelphia trial that sparked a national debate over the legal rights and duties of mothers and fathers, and husbands and wives. The story of the d'Hauteville case explains why popular trials become 'precedents of legal experience' - mediums for debates about highly contested social issues. It also demonstrates the ability of individual women and men to contribute to legal change by turning to the law to fight for what they want.